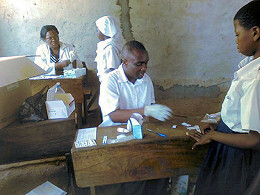 Medicines for Muheza is a small, UK registered charity which has helped transform the work at St. Augustine's Hospital in Muheza, Tanzania over the last 30 years. Our community in Chieveley has supported it for over 20 years. What is the connection with Chieveley? 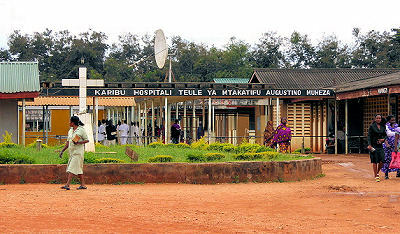 Elizabeth Hills, who was a mission doctor at the original district hospital in Muheza, lived in Chieveley and since then a succession of doctors who have worked at the new hospital have been to talk to our community (church communities in Chieveley and Winterbourne plus Chieveley Primary School). More recently Edgar and William, who both work at the hospital, visited Chieveley to thank everyone for the support and to provide an update on how things are progressing. 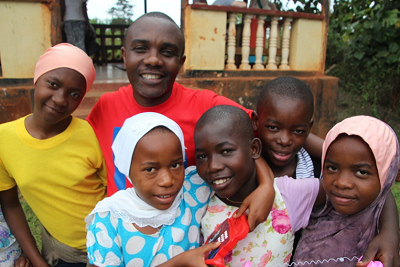 Also, for some years Chieveley Primary School raised money for a girl called Pili whose mother was treated for HIV at the hospital whilst pregnant. As a result of this treatment Pili was born HIV-negative and was able to study at a local convent school, courtesy of the money raised by the School. In 2014 Sarah Wierszycki and her family visited the hospital and the school, to see it all for themselves. "Tanzanians are warm, friendly people - "Karibu" (You are welcome) is heard repeatedly and it is genuine. We saw the amazing work at the hospital and hospice and witnessed the enthusiasm for a better education for the children. There, nothing is taken for granted" reported Sarah after the visit. Others would be welcome to be involved and visit. Please let Sarah know if you might be interested or want to find out more. See top left of page for contact details. The work at the hospital is quite literally changing lives on a daily basis, with very limited resources. It is brilliant to know that between 96 and 97 pence in every pound donated is being put to work there. The program of antenatal and postnatal care continues and the results are steadily improving - cutting mortality for mothers and babies and babies are being born HIV negative from HIV positive mothers. The hospice attached to the hospital runs a programme to keep terminally ill patients free from pain and offers counselling to hold families together as well as providing education to keep HIV children and adults healthy. Our target for the coming year is to continue to help pay Edgar's salary as well as buying specialist medicines which are not readily available in Tanzania. Edgar is as enthusiastic as ever and absolutely passionate about his work. He is a trained teacher, social worker and is also trained in palliative care. He is a busy man and there are lots of success stories in saving lives and preventing transmission of HIV, but also a lot of challenges with very limited resources. An idea that came out of Edgar’s visit to the UK in 2016 was the training of champions - youngsters who would help and counsel their peers. 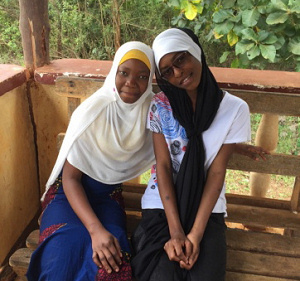 One of these champions is Scolar pictured above with her friend Halima. Scolar was very ill at the age of 15. She had Tb and missed a lot of school. At 17, she was diagnosed as HIV positive (her parents had no idea that they also had the infection and had passed it on) and asked if she would like to come to the club. She was surprised to find her school friend Halima was also there. She said Saturdays are her favourite day: “When we come to the club everyone has the same problem, we all support each other and feel free and happy”. 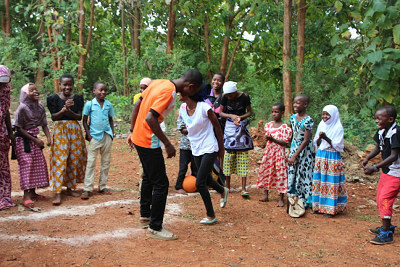 Scolar will be the leader of the Muheza group who will be working with some young people coming from the UK in 2019 – all of whom have lost a close relative. Federick, seen above dancing with Scolar, is another champion. He is 19 and has been on treatment for HIV since he was eight. His mother died when he was 5 and his father 2 years later. He has been brought up by his sister and now earns a meagre living selling clothes for his aunty. Edgar is trying to set up education in life skills and micro-finance for these youngsters who have missed out on childhood through ill health and bereavement. 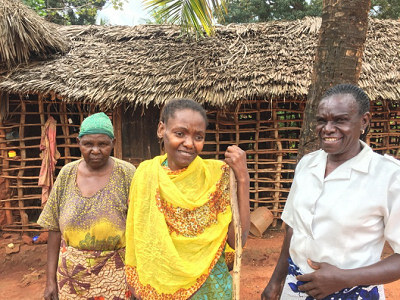 Mary, seen above with her mother and Herriett, the palliative care nurse, was a receptionist at a hotel in Dar es Salaam when she developed cancer. She ran out of money and only completed half her treatment and eventually came home to her parents with a huge, very nasty smelling and extremely painful wound in an unmentionable place. Her parents built a small extension to the mud hut for her as they couldn’t cope with living with her. The hospice home visiting team heard about her and now visits regularly. The wound is cleaned and no longer smells and with regular doses of morphine she is free from pain. When Herriett introduced her to Dr Karilyn Collins who started the hospice she took her hand and said “Ninakushukuru sana” …..Thank you. In all cases please let Sarah Wierszycki know of your donation so that gift aid can be claimed where appropriate. Gift Aid Form available here. If you decide to set up an annual payment it would be helpful (but not esential of course) if payment was made around 7 November each year. This eases the administration work. Please make cheques payable to Medicines for Muheza and either drop in to Paul Medley at Westfield House, High St, Chieveley (2 doors north of Quackers) or post to Sarah Wierszycki at 45 Southmoor Road, Oxford OX2 6RF. 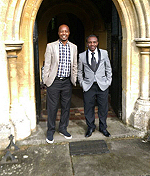 In October 2016 Edgar and his colleague William visited the UK and spent time in Chieveley. 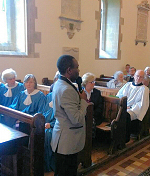 They addressed the community at St. Mary's Church, passing on thanks for all the support and engaging everyone with their update and stories from the hospital.